This is considered a classic of the thirties, written in 1937 by one of the major Hungarian writers of the twentieth century. He was a formidable scholar, and wrote a number of non fiction works which are still considered important in the field today. He was from a Jewish family, who had converted to catholicism. During the Second World War, he was given numerous chances to escape antisemitic persecution (as late as 1944), but he chose to remain in Hungary, where his last novel, a Pirandellian fantasy about a king staging a coup against himself, then having to impersonate himself, (Oliver VII,) was published in 1942. It was passed off as a translation from the English, as no ‘Jewish’ work could have been printed at the time. Szerb was deported to a concentration camp late in 1944, and was beaten to death there in January 1945, at the age of 43. 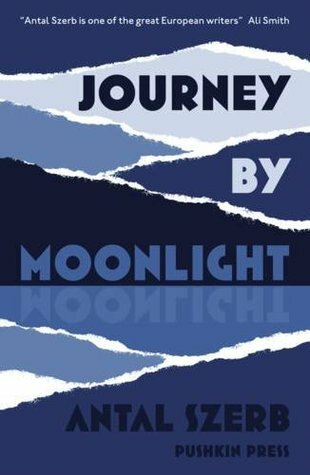 Journey by Moonlight was translated from the Hungarian by the renowned and award-winning Len Rix. Mihály has dreamed of Italy all his life. When he finally travels there, on his honeymoon with Erszi, he soon abandons his new wife in order to find himself, haunted by old friends from his turbulent teenage days: beautiful, kind Tamas, brash and wicked Janos, and the sexless yet unforgettable Eva. Journeying from Venice to Ravenna, Florence and Rome, Mihály loses himself in Venetian back alleys and in the Tuscan and Umbrian countryside, driven by an irresistible desire to resurrect his lost youth among Hungary’s Bright Young Things, and knowing that he must soon decide whether to return to the ambiguous promise of a placid adult life, or allow himself to be seduced into a life of scandalous adventure. Szerb has a stunning talent for description, and I found myself fully immersed in 30’s Italy, in the Italy of my imagination. The characters are strange and dreamlike, none that we feel we might actually meet in Real Life. They are not exactly larger than life, but rather different from life, from another dimension, perhaps. The journey is one every young person takes, if only in their head, one of exploration, searching for redemption for unknown sins and a clear path for the way to Life.